There are a few special tricks that can be achieved with simply adding the parameters below onto the end of the query string. Any other special effects, that are not listed below, are not available via Jackrabbit coding and would require the skill of a webmaster to manipulate the table display. use the | symbol to join/show multiple Cat1 (Category 1) names in the same table; can also be used for Cat2 or Cat3. Note this will not work with the old traditional codes. The Category 1, 2, and 3 query string searches act as wild card searches based on the "starts with" principle. This can be handy if you want to combine several Category 1's (or 2's or 3's) together and they have a similar name that starts with the same spelling. For example, if you have Category 2 values called Tumblebees, Tumblebugs, and Tumbletots, you can include ALL those in the same table by just using &Cat2=Tumble. It will return all classes that have a Cat2 value that begins with Tumble. &exact=1 - put this right after a cat parameter to force (limit) the return to the EXACT spelling. For example, let's assume you have several Category 2's with these names: Baby, Baby and Me, Babydoll, Baby Sings. If your code contains &Cat2=Baby, it will return ALL four of those as they all start Baby. To get ONLY the Baby (and exclude the others), you'd need to use &Cat2=Baby&exact=1 in the code to limit the return to the exact spelling only. 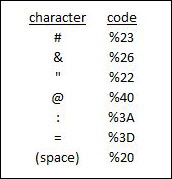 HTML does not like special characters in text. If you have characters in your Session or Category names, it may likely break the code. We strongly discourage the use of special characters in Session and Category names in your database. Worst case example: If your Session name was Summer #B @pool, it would have to be coded as Summer%20%23B%20%40pool.